I’d planned to take a break from collecting 2014 baseball cards until Topps Series 2 came out next week, but my friend Bart gave me a few Bowman cards when I saw him this weekend. While the baseball card blogging community has already moved on to Topps Archives (which I still plan to ignore), I’ve reconsidered my decision to skip Bowman. This flashy update of the 1989 Bowman card design is a big part of the reason why. It took a few years for Topps’ Bowman relaunch to catch on, so I didn’t think there would be much nostalgia for this first set. But I remember going on a family vacation to Ocean City, NJ in the summer of 1989 and spending almost all of the money that I’d brought with me at a baseball card show held on the pier. I added a whole bunch of oddball cards to my Gary Carter collection, I picked up the last few Topps Doubleheaders “cards” I needed to finish that set, and I bought two boxes of the newest product to hit the market – 1989 Bowman. Those 1989 Bowman cards stood out because they were slightly taller than the standard size cards that Topps had made since 1952, but also because they featured players that weren’t in all of the other baseball card sets. Bowman was the first time that Topps made a real effort to include draft picks and prospects that hadn’t yet made it to the major leagues. The coolest cards in the set might be the father-son subset that featured Sandy Alomar Jr./Sr., Ken Griffey Jr./Sr., Cal Ripken Jr/Sr. and Todd Stottlemyre & Mel Stottlemyre Jr./Sr. I’m ok with the changes – part of my dislike for the Archives brand is seeing baseball cards that look almost like they belong to sets from my youth, but they don’t really fit in (either due to minor style changes, players who don’t belong to that era, or players who do belong in that era but are wearing the wrong uniforms.) 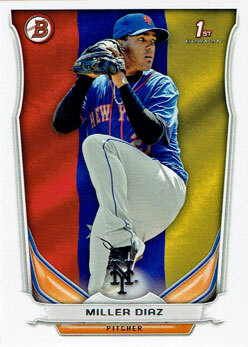 This insert series is clearly inspired by the 1989 set, rather than an attempt to recreate it. 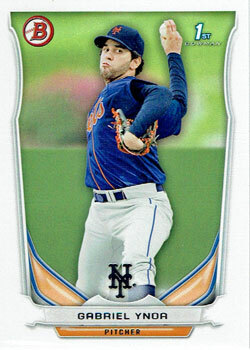 The standard Bowman cards don’t look bad this year, either. But as usual, the prospects set is full of a lot of guys who are too far away from the major leagues to be familiar names. 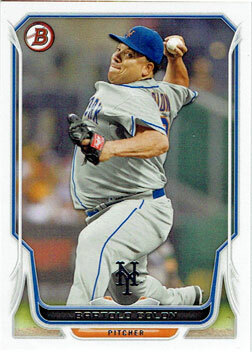 We all know Bartolo Colon (though Topps still hasn’t managed to get an actual photo of him in a Mets uniform on a baseball card.) Except for a few rocky starts, he’s done well for the Mets this year. 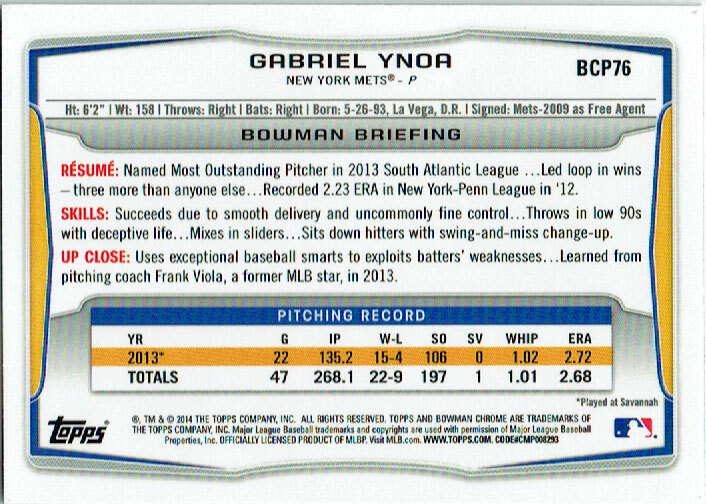 Gabriel Ynoa is a 21-year-old right-handed pitcher who’s playing for the St. Lucie Mets in the Single-A Florida State League, where he is 5-2 with a 3.88 ERA through 10 games. His control is impressive: last year, he walked just 16 batters in 132.5 innings. He’s got the #14 spot on MLB.com’s list of the best prospects in the Mets organization. 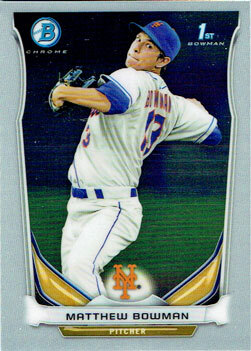 Matthew Bowman is a 23-year-old right-handed pitcher who went to Princeton University. 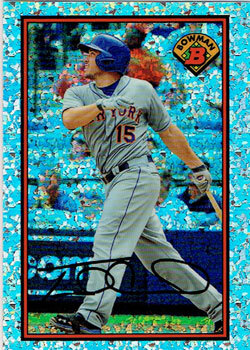 A 13th round draft pick in 2012, Bowman is playing for the Double-A Binghamton Mets this year, where he is 3-3 with a 4.18 ERA through nine games. Miller Diaz is a 21-year-old right-handed pitcher who plays for the Single-A Savannah Sand Gnats. Through eight games (seven starts), he has a 5-0 record and a 1.93 ERA. In 42 innings, he’s already racked up 53 strikeouts (and 18 walks). 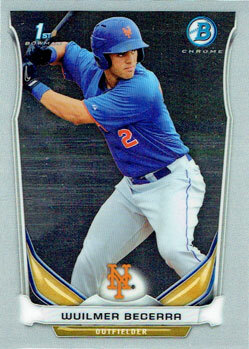 Wuilmer Becerra is a 19-year-old outfielder who the Mets acquired in the 2012 R.A. Dickey trade. 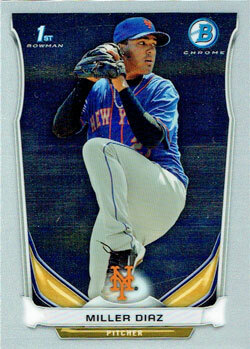 He will probably be assigned the the Rookie-level Kingsport Mets in 2014.